In Yemen two and a half years of violence and conflict have pushed two-thirds of the population to the brink of famine. Limited access to ports has hindered the ability of the World Food Programme to deliver aid and at present some 17 million people across the country do not know where their next meal is coming from. What’s worse, the collapse of government services and a shortage of potable water has led to a cholera epidemic. Despite the obstacles, WFP implements general food assistance in 19 of Yemen’s 22 districts, including some of Yemen’s most hard-to-reach areas. The program’s targeting strategy assists the districts with the highest levels of food insecurity and global acute malnutrition rates. To ensure that the programs are thoroughly monitored, WFP contracts third-party monitoring companies to conduct on-site distribution monitoring and post-distribution monitoring. 60 Minutes aired a segment on Yemen in November that featured WFP’s intervention there. The clip can be viewed here. A second grant will go to South Sudan, where continued conflict is driving the country towards famine and leaving an estimated 6 million people with acute levels of hunger. Because of the ongoing fighting and the breakdown of virtually all infrastructure, WFP has turned to airdrops to deliver aid. Airdrops are generally more expensive and more time-consuming than ground level delivery, but they become necessary when there are no alternatives to providing life-saving food. A third grant will go assist the Rohingya refugees from Myanmar, who have sought safety in neighboring Bangladesh. 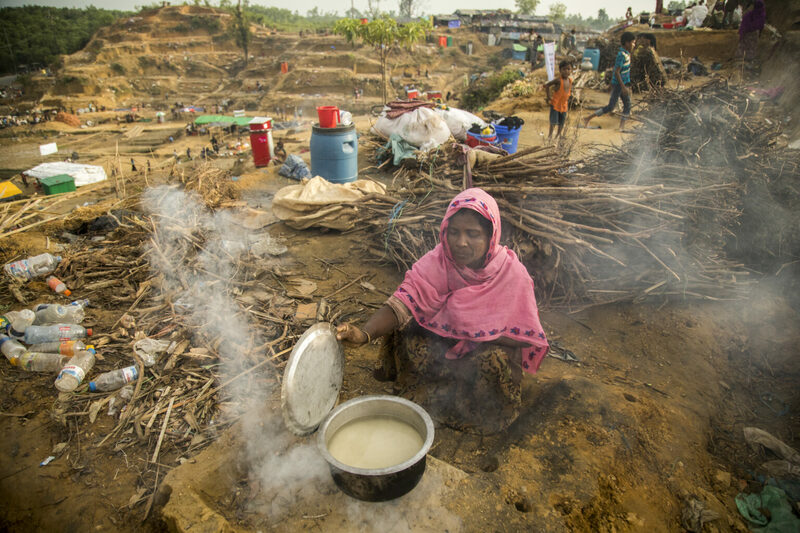 At present approximately 650,000 refugees have fled their homes in Myanmar and crossed into Bangladesh; more than 80% of them need food assistance. WFP has been rapidly expanding its emergency nutrition programs there to stave off malnutrition in young children and pregnant and breastfeeding mothers. Its funding shortfall for aid is currently at about $32 million. This entry was posted in Buddhist social ethics, Emergency relief, Engaged Buddhism, Food shortages, Projects & programs and tagged Bangladesh, Children's hunger, Global hunger, Rohingyas, South Sudan, world food programme, Yemen. Bookmark the permalink.